Layar has a new augmented reality app function for iPhone and Android that's delightfully depressingly topical: It'll let you see exactly where bailout money went, via recovery.gov, which is pretty sweet since you sort of own all that stuff! Layar is an application that overlays your view of the real world with waypoints representing your favorite coffee place, the movie theatre you're trying to find, or in this case, where some of that $787 billion from the American Recovery and Reinvestment Act is going. 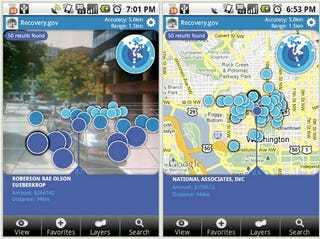 If you have an iPhone 3GS or Android device you can install the Layar app for free and then search for "recovery" or "sunlight" within Layar to find this layer. The layer works best near large cities where you are most likely to find recovery contracts.